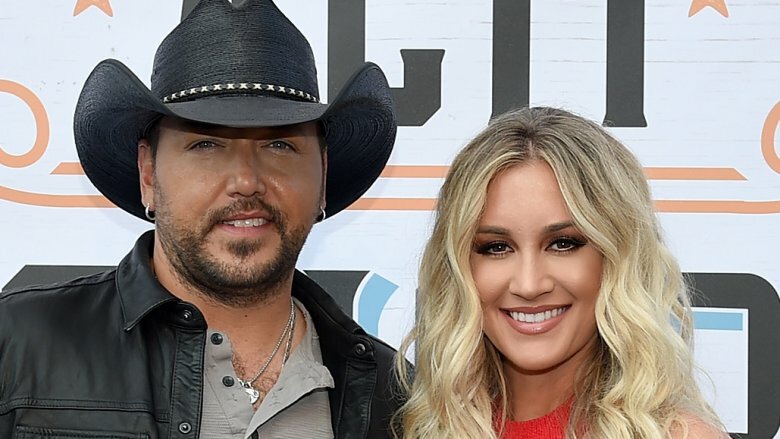 Country singer Jason Aldean's wife, Brittany Kerr, remained hospitalized days after welcoming the couple's second child together. Kerr revealed her stressful situation on Wednesday, Feb. 6, 2019, taking to her Instagram Stories to share that she was still in the hospital, as reported by Extra. She posted a video showing her swollen feet and wrote, "When your labor goes amazing but then things go south." She continued, "Still hospital living with my trooper of a hubs and a precious little girl." Noting that she has "swollen everything," she also told her followers that she had a blood transfusion. Regardless of her health, Kerr said that it was "#WorthIt," in exchange for having her baby (via People). In a separate post of her feet, Kerr lamented, "So we've been in the hospital for days now. And I'm ready to take these fat little piggies home!" As noted by Us Weekly, Kerr's husband can be heard laughing in the video. At the time of this writing, it's unclear just why exactly Kerr needed a blood transfusion or why she was in the hospital for so long. However, a rep for Kerr and Aldean remarked on the American Idol alum's health to People magazine, stating that there's "nothing to worry about." And fortunately, all seems to be well at the moment. Late on the night of Thursday, Feb. 7, Kerr shared on her Instagram Stories that she was finally out of the hospital and presumably back at her house with her family. She shared a Boomerang video of her kitchen, showing two trays of what looked like lasagna and garlic bread on her stovetop. On a counter was a bouquet of pink and purple flowers. On the clip, Kerr simply wrote, "Home." We're glad Kerr's been released from the hospital and hope she quickly recovers from whatever ailments she may have be experiencing after giving birth. After all, she's going to need her full energy as she and husband Aldean care for their newborn baby. Kerr, 30, and Aldean, 41, welcomed their second kid together — daughter Navy Rhome — on Feb. 4. Aldean announced the happy news on his Instagram. Alongside a sweet photo of baby Navy, Alden wrote, "Today our family became complete as we welcomed our daughter Navy Rome to the world. Born on 2/4/19 weighing 7lbs 12oz and looking identical to her older brother." He went on, "So excited to watch what life has in store for this little princess." Kerr posted a similar photo of her Instagram page, noting that Navy was "pure preciousness" and adding, "We love you so much baby girl!!" Besides baby Navy, Kerr and Aldean share a son — 12-month-old Memphis. Aldean is also a father to two daughters from his previous marriage, 15-year-old Keeley and 11-year-old Kendyl. Not long after giving birth to Navy, Kerr shared a video on her Instagram page of her son, Memphis, meeting his baby sister for the first time. In the video, Aldean holds Memphis, who's wearing a cute shirt that says "Big brother," as the boy leans forward and gives a sleeping Navy a kiss, resting his face by hers. "See Navy? You give her sugar?" Aldean asks Memphis in the clip. Jason Aldean opened up about adding another kiddo to his family back in November 2018. Regarding Kerr's pregnancy, he told Extra, "It's exciting. It's a little bit of a crazy time in our house but it's about to get crazier here pretty soon. But it's a lot fun, you know, having two little ones in the house. Next year will be definitely a different vibe for sure." He added, "It's kind of exciting for me. I'm having to relearn a lot of things that I forgot with my older two, just changing diapers." Regarding all the women in his family, the "You Make It Easy" singer noted, "But at least there's one boy in there. … Tensions get a little hot in the house, and me and him will go fishing or something, get out of the house for a while." 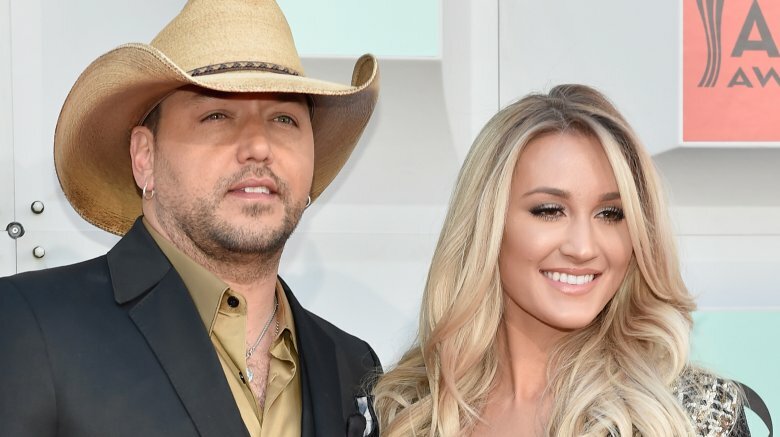 While his household may be "crazy" now — and probably for years to come — we're sure Jason Aldean and Brittany Kerr are loving every minute of it.